An SUV is a very spacious vehicle that you can use as a family vehicle or for typical commuting. If you plan to use your vehicle for moving cargo of some sort, you may be able to stow some of your seats or re-arrange in order to create more space. Loading up cargo into your SUV isn't as easy as it sounds. You want to make sure that your vehicle is protected, as well as the items that you are going to be driving around with. Large items should always be wrapped up. This prevents damage to the item as well as damage to your vehicle. 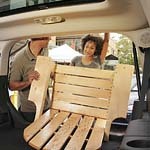 Don't place a large item in the middle of your SUV trunk and expect it to be ok there for the whole ride. You need to situate items so they don't have room to bounce around or tip over. If you would like assistance with figuring out your best cargo situation, stop down to Faraz Auto Sales today!